Five housemates were tied on one country vote each. The tie-breaker rules therefore applied and the four contestants with the lowest percentage vote for all countries were evicted. Thanks to everyone dat voted for Tayo, God bless us all. Still keep voting. No rest dis week. Tayo said he represent the young strugglers in Africa and so believe in him. He is already asking JJ to know where he think he fit in best in the acting industry. What an open heart. Tayo for the money because he will carry others along. Thank you Africa for saving your boy Akintayo. We love you loads and he wont dissappoint you guys. Namibia, kenya and tanzania thank u for voting our idris, so sad for our ellah, shame on u rwanda u failed to turn back a favour to ur naighbour (uganda). Damn u rwanda. Uganda now let join hand and vote 4 idris. I think we should never ever hope for Rwanda's vote! Lets leave them aside as if they aren't there ! UTAKE is the deal here! Please ignore Rwanda! Ug Tz,Kenya,Rwanda and the rest of Africa its our turn to show solidarity and vote for home boy Idris. Southern Africa,Western Africa,Central Africa,Eastern Africa and Northern Africa please lets put hands together and vote for the True son of AFRICA Macky2.Please love you all ONE LOVE,ONE BLOOD AND ONE AFRICA. God bless u africa for keeping our favourite boy Tayo in the house!! I have been an on-looker since this show. I love Nigerians. The oneness in that country is unbelievable when it comes to their own especially if he/she shows the true Nigerian spirit. Tayo is the most honest man I have seen in a long time in reality TV. He deserves to win this time after series of ill luck according to him. Therefore, I am going to exhaust my 100 votes to be a part of the expansion of his dream this week. I hope he wins. I am with you FJ. Tayo has played a good game. My vote goes to Mam Bea. A true African lady. I think Nhlanhla has played a good game. An honest and sincere player ,so I will give him all my votes. A true gentleman indeed. People like you are the reason why africa isnt uniting. Pls guys no more insults or hates just vote for whom you think deseves the money.Thank you Ghana Rest of Africa Ruwanda and Nigeria for keeping Tayo. # Team Tayo Cameroon. Idris doesn't deserve any votes from Uganda.he doesn't have a good heart. I am 100 pc sure you aren't Ugandan! Shame on you! Ugandan will surely wish Idris the best! So shut up and mind your business! Tanzania and Uganda are siblings and we can argue at home but when facing the world we stand together! haters pls did talk about Tayo lets vote for him. thanks zambia for saving sipe. vote sipe for the money. Voting Tayo all day. D realest guy even d evicted housemates say a lot abt him. D guy is just cool, u dnt expect him to be perfect. He's d reason y am watching bba today if nt dis year would ve been d worst show so far. So tayo, u ve my vote. Big brother JJ also had votes only from Zimbabwe how come was not evicted? ThankGod for my TAYO, PLS MOZAMBIQUE, RWANDA, AND ROA LETS DO IT FOR TAYO. 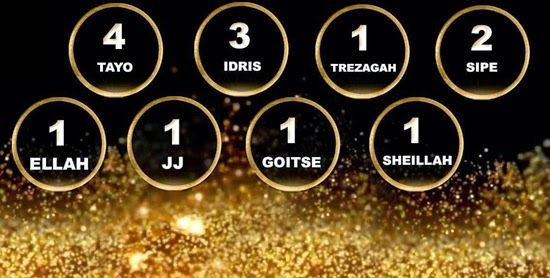 idris you are the winner .Ellah keep them coming the votes,i am Zimbabwean but my bet is on idris considering sadc is still represented by more people.jj u rock man but chances very little considering the reason i mentioned above .butti you rock too my gal but eish tight my hommies.let the best man win . I dreamt about Mam'Bea. May be because I thought about her a lot before I went to Bed. Good home training reflected in every of her move. She is a kind of girl every woman will want for their son. I pray that her dreams that she is quietly pursuing comes to reality in no time and that she falls into the hand of a responsible man on whose head she will be a crown. I don't know if can win but good luck to her. Rwanda show solidarity and vote, for East Africa . Nigeria will never vote for you. Rwanda , if only you had voted for Ellah, East Africa would have two reps in the finals.....the game is all about regional voting unless your countries are already voted out. all housemates have talent and are entertaining. Mam B has a mother's heart. She's so loving and caring. nigeria has voted for sheilla and goitse before so what are we saying here.botswana tayo need your vote because we have been loyal to u. After insults from your boy..Bots is givin its vote to Nhlanhla,period..
Zambians and SADC please lets vote for Mackey 2, if God is for you who can say no. The game is sometimes boring because of TAYO.... Lets vote for IDRIS who makes it alive all the time. If all housemates were acting like TAYO, I dont think if anyone of you would like to watch BBA.